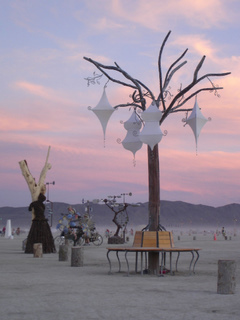 The Tree Spires was the first project under the name Iron Monkeys. We created 4 15' tall trees that were part of the "Man Grove" around the man. They were placed at the 12, 3, 6, and 9 o'clock positions. Temporary install of a Tree Spire in Downtown Reno along with trees from 4 other artists.